Just to leave a disclaimer at the start; this review will not take anything involving the recent controversy regarding this game’s creator into account. This review is going to strictly focus on whether Depression Quest is a good game or not — as a review should. For the rest of you who are unfamiliar with this game, Depression Quest is an attempt at telling the story of a man suffering from severe clinical depression as he tries to go through his day-to-day life and cope with said depression. While it is not a game in the conventional sense, it is still an interesting idea, to say the least. However, interesting ideas do not always make for good games. So, that begs the question of whether Depression Quest will be a deep and emotional game with a powerful message, or an overly angsty and preachy mess. The only way to find out is to read on. 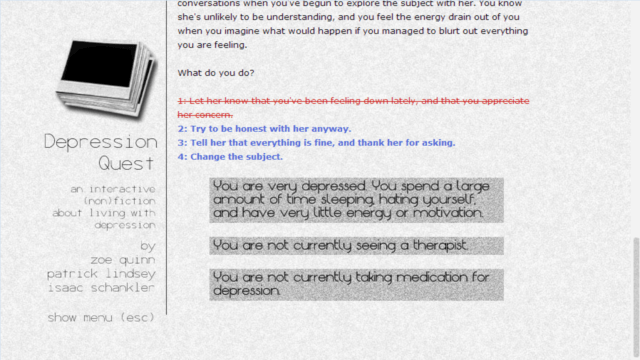 Depression Quest is, in actuality, more of a text novel than a game. The main setup and progression of the game is very simplistic and straightforward. It starts out with a bunch of text that narrates the story from your main character’s point of view until you are given a decision to make. Depending on which option you choose, you will have a different scene showing the result. The main series of events that occur throughout the game are mostly the same, with a few being changed slightly based on previous answers. However, the choices you make will also have an effect on your character’s level of depression. At all times throughout the game, your character’s current level of depression will be displayed in addition to a description of his state of mind. Your character’s level of depression will, in turn, affect what options are available in later choices, which leaves you with fewer options available the more depressed you are. Of course, there are some situations where options will always be crossed out in an attempt to portray just how powerless one normally is in a situation like this. Your character’s level of depression will also change the ending slightly. Presentation-wise, Depression Quest is honestly very poor. Before being released on Steam, the game was a browser-based title that advanced simply by reading the text and selecting options. The Steam release does not change anything, and it still plays out exactly like navigating a webpage. There is no animation or any character art of any kind, and the only images are of photos that only vaguely resemble the current scene. I will just clarify that I personally do not consider Depression Quest to be a game and am only judging it by the standards of such because it was released on a game distribution platform. That is not to say that Depression Quest cannot hold legitimate artistic merit due to it not being a game, but more so that one should not expect to be entertained in the same way that a game typically would. However, that still does not excuse the fact that there was very little effort in the presentation department, and that Depression Quest does not even try to convince you that it is a game. Sound-wise, there is a bit more of an effort. Throughout the entire game, you will hear the same ten-second piano loop constantly. I will give Depression Quest credit in that this is effective in conveying the mood of the game by symbolizing the feelings of emptiness and repetition that come from depression. Sometimes there will be some other form of background noise included in an attempt to represent the area that you are currently in, but there are no other sound effects or voice acting throughout the game. Now for the part that really determines whether Depression Quest is worth experiencing; the question of whether or not it tells its story and gets its message across well enough. The story is told from a second-person perspective in the place of an unnamed character. You try to manage your typical everyday events such as a tedious 9 to 5 job, relationship problems and your antisocial nature. While these events do sound uninteresting, Depression Quest does do a good job of portraying them the way someone with clinical depression would see them. I can attest that the portrayal is accurate seeing as someone who has suffered from depression at one point in his life, as well. There is never any reason given as to why you are depressed, and this is ultimately because there is no real reason it occurs other than a chemical imbalance. 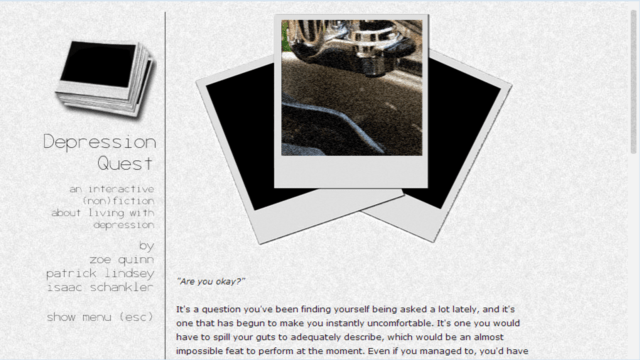 Depression Quest does its best to combat the popular misconception that depression is an emotion. Depression, in actuality, is a mental disease that causes someone to feel very little emotional stimulation at all. While Depression Quest has done a good job at accurately representing the disease, there is one important aspect that it forgets about; making the player relate. The key problem with Depression Quest is that the approach to the gameplay is the exact opposite of what one would take in real life. Just about every decision is made based solely on logic and on what would be better in the long run. Just about everyone who plays this will know that it is better to go see a therapist and start taking medication. Everyone will know that it is better to try and force yourself to go into work despite you barely feeling motivated enough to get out of bed. Even people who do suffer from depression know they are making a bad decision when they do these things, yet they still do so because they feel their own depression is too overwhelming. Yet in Depression Quest, these choices feel no different than when the Dragonlord asks you if you want to join him and rule the world together instead of slaying him like you were supposed to. As a result, the game completely misses the most important part of making a game about depression; to show what it is like to deal with it. The story, characters and setting are also as realistically boring as possible. While some may say that this was the game’s intention, I personally do not see this as a valid excuse. If these characters have no personality and these events are uninteresting, then there is no reason to care about anything that happens. As depressed as people are in real life, they will see their own life differently than how it is presented in Depression Quest. In real life, the struggles that one faces are upfront and place a huge burden on whoever is suffering from them. In Depression Quest, events that would take hours in real life go by in mere seconds. 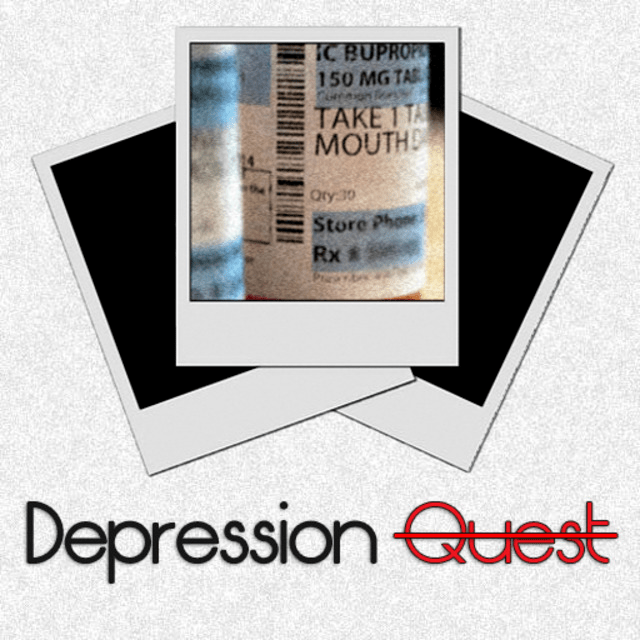 As a result, the story of Depression Quest is told as more of a cliff notes version of what it is like to live with depression rather than a true experience. Yet another way how Depression Quest misses the mark is that it does not even try to explore the darkest aspects of depression. In Depression Quest, there is never any acknowledgement that your character could crack from the pressure and end up committing suicide. Considering that this is ultimately what the worse cases of depression lead to in real life, and that this is a game whose main goal is to show what it is like living with depression, there is no excuse to pull any punches. Even if you pick the absolute worst choices in the game, which would be against one’s better judgement as stated prior, the worst ending you get is hardly any different from the other endings. This is despite the fact that the worst endings basically have your character lose his job, girlfriend and most of his friends, which would almost invariably lead to a tragic end under these circumstances. 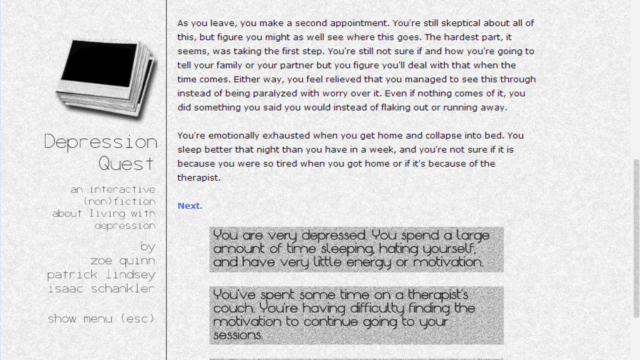 Depression Quest feels like a rather half-hearted effort overall. I can technically recommend the game seeing as how it is free, and that one can get through one playthrough in under an hour. However, it is not a good sign if those are the only reasons I can recommend it. To an extent, the game was kind of compelling, and I suppose one can learn a bit about depression from it. Unfortunately, it’s a game that failed to accomplish what it set out to do. This is made even worse when one considers that Depression Quest cannot even rely on its gameplay or presentation. In the end, no one should play this game if any money is charged for it, and the only reason there is to play it is out of curiosity.